The film producer Vincent Giordano’s personal tickets for the Opening Night VIP reception and Festival Awards Ceremony on September the 13th are all gone. The ceremony will include the first screening of Born Warriors (Part One). There will be no filmmaker dialogue before or after the screenings. He has been told by the film festival’s organizers that the Sunday, September 14th screenings are FREE and they will issue an ALL DAY PASS so people can come and go to the specific films they want. How many tickets they have and how fast they will go is something he can’t determine. Born Warriors (Part One) will screen first on Sunday at 1:15 pm and that will be the only screening for the film. For further information, please call the NetMAA office at (626)537-9990. There are other screenings planned in October and November hopefully on both coasts. The film producer Vincent Giordano will update everyone as he gets the confirmations. He is still working on Born Warriors Redux and trying to expand on it, by adding one more shoot in Burma if possible, so he is raising the funds now. He is committed to getting the project out in November. Everyone is working hard to make this happen. You can support this work by clicking the like buttons or by donating through the tip jar. He will update everyone again after the festival. 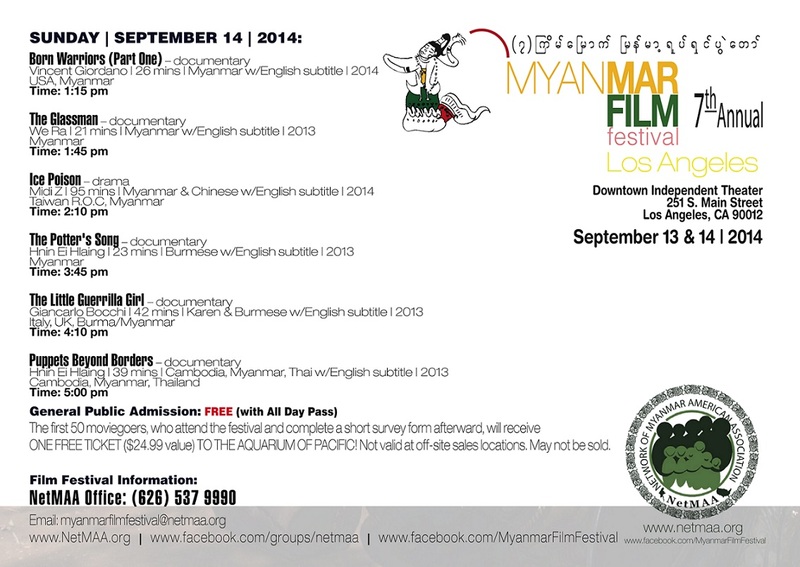 This entry was posted in Events and tagged Born Warriors, Burmese Lethwei, Cinejutsu Entertainment, featured, Los Angeles, Myanmar Film Festival, The Vanishing Flame. Bookmark the permalink.